It took Aaron Sorkin 15 years to finally go from the writer’s desk to the director’s chair, and in some respects, Molly’s Game feels like the work of an experienced filmmaker. The story of Molly Bloom’s rise and fall as the organizer of the world’s most exclusive and star-studded poker game comes with all the classic Sorkin ingredients already in place: a realistic backdrop; a strong-willed protagonist who is alternately living and failing at the American Dream; and characters talking very fast à la Jesse Eisenberg in The Social Network, the Sorkin-penned movie that Molly’s Game most overtly and transparently resembles. In relating her outrageous story (which is told in a series of staccato flashbacks, exactly like The Social Network), Molly proves to be a cold-blooded, calculating operator, which explains Jessica Chastain’s weirdly detached acting style, but only to a point. Behind her period-appropriate but still overly exaggerated hair and makeup, the actress simply can’t communicate any real, complex emotions, nor deliver her wittiest lines (and this being a Sorkin script, there are a few, though fewer than in The Social Network) with any real conviction. 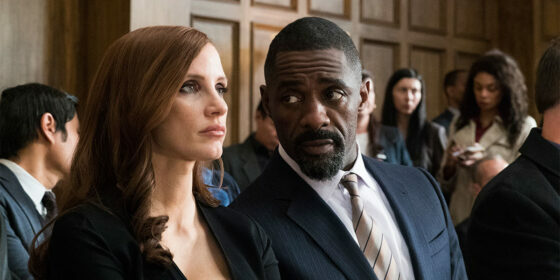 To give credit where it’s due, Molly’s Game finds intelligent and funny ways of presenting the most absurd facts of its heroine’s life: the opening scene even pokes fun at Sorkin’s love of useless but impressive numbers (as in Moneyball) and calculations with a mathematically precise description of the factors leading to the competitive skiing accident that compels Molly to go all-in on a life of crime. Sorkin can’t help but completely make things about himself, however, and his relentless attempt to be cool and self-aware quickly becomes tiring. As for his attempt at a more feminist approach, it’s unfortunate that, having finally decided to put a strong, determined woman at the centre of a story, he turns her into an unfeeling and uninteresting robot.